AUBURN, Ala. (AP) — Jarrett Stidham and No. 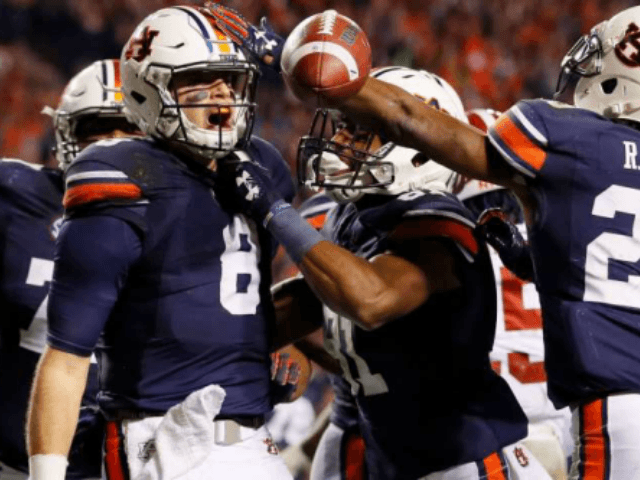 Auburn dominated top-ranked Alabama 26-14 Saturday, earning a berth in next week’s Southeastern Conference title game. The Tigers quarterback passed for 237 yards and ran for a fourth-quarter touchdown to set up a rematch with No. 7 Georgia in the SEC championship game Dec. 2 with a playoff spot almost certainly on the line. Auburn (10-2, 7-1 SEC, No. 6 CFP) mostly shut down the league’s top scoring offense for their second win in three weeks over the top team in the playoff rankings. They won the Western Division a week after dispatching the Bulldogs with similar precision. The Crimson Tide (11-1, 7-1) made a rare assortment of mistakes for a team that had appeared to be headed toward a shot at a fourth consecutive SEC title and playoff berth. Auburn fans stormed the field after the final play, creating a scene similar to 2013 when the fourth-ranked Tigers beat No. 1 Alabama on a last-play, 109-yard return of a missed field goal. With No. 2 Miami losing Friday night to Pittsburgh, it’s the first time the top two teams in the AP poll have fallen on the same regular-season weekend since Nov. 17, 2012. Then, No. 1 Oregon lost to No. 14 Stanford and No. 2 Kansas State went down to Baylor. Stidham completed 21 of 28 passes and ran for 50 yards, including a 16-yard touchdown scamper early in the fourth quarter. Ryan Davis caught 11 passes for 139 yards. Alabama’s Jalen Hurts passed for 177 yards and a touchdown while running 17 times for 80 yards, but neither he nor the Tide offense ever really seemed to get going. Alabama had a devastating sequence after Auburn took the lead late in the third on Johnson’s 1-yard run. Trevon Diggs’ 55-yard return set the Tide up for a potential go-ahead score, and a pass interference against Auburn helped. Hale Hentges nearly caught a tipped pass in the end zone but replay overturned the touchdown call. Then the Tide botched a field goal attempt with a bad snap. Alabama had two straight botched snaps on a promising drive in the fourth quarter, failing to make good on a do-over after an Auburn penalty on the second. Alabama: Didn’t play with its normal poise in big games. Failed on its first six third-down attempts and finished 3 of 11 while allowing Auburn to convert on half of its 18 attempts. Tailbacks Damien Harris, Bo Scarbrough and Josh Jacobs each had only six carries. Auburn: Continued its revival from early and midseason struggles. Held onto the ball for 36 minutes and 78 plays. Alabama waits for its bowl destination and must hope for help to make another playoff trip. Auburn faces the Bulldogs in a rematch of its 40-17 win on Nov. 11.